Environmental matters are naturally close to the heart of our many environmental lawyers. Most recently, we helped the Connecticut River Watershed Council restore the Chickley River in Hawley. The river’s ecosystem suffered a blow when a contractor removed the stream’s boulders, and created a deep artificial channel. A&K helped in the legal – and later physical! 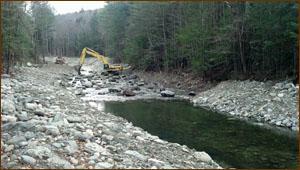 – effort to put the stones back so that fish and wildlife could thrive once more.